Shiny Red Jeans Volcano by BlueMar. You haven't seen anything like these shiny red jeans. Featuring deep red jeans finished with a coated denim treatment for a glossy, faux leather look. Constructed with front and back pockets, button and zipper fly, and belt loops. Shiny red jeans designed with a flattering straight leg and slim fit. 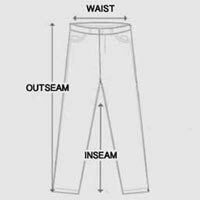 Comfortable denim interior made from blue cotton fabric with slight stretch. Treated with subtle whiskering and fading for a multidimensional red hue. Look scorching in fiery denim with these shiny red jeans.